When it comes to using hormone replacement for brain health and Alzheimer’s there are some important things to know. The topic is very controversial and the medical literature can be quite confusing. I wrote this article to provide a perspective on Hormone Replacement with estrogen and progesterone on brain health. Obviously, the brain is not cut off from the rest of the body so the article considers hormone replacement within the greater context a woman’s overall health status- the benefits as well as the risks. After reading this, you should feel more confident in answering the question “is hormone replacement right for me?” Spoiler alert…I tend to support sensible use when benefits appear to outweigh risks. A woman’s estrogen and progesterone drop by up to 90% after her menstrual cycle stops. These decreases have many impacts on a woman’s overall health – both mental and physical. if you haven’t experienced this yet yourself, ask just about any woman you know that has gone through the change! And while not all women have classic menopausal symptoms of hot flashes, irritability, brain fog, lower libido, and disrupted sleep, many certainly do. Hormone Replacement Therapy – HRT for short – is the process of taking a pill, cream, patch or suppository to increase a woman’s estrogen and/or progesterone during the transition into and after menopause (note: there are other hormones that can be addressed with HRT, such as testosterone, DHEA and Thyroid but are beyond the scope of this article). Typically, estrogen and progesterone levels are not replaced quite to PRE-Menopausal levels but are increased significantly with HRT. Estrogen comes in a few forms. The predominant form of estrogen is called, Estradiol. Starting in the 1950-60s (and to some extent continuing until today), HRT typically involved a woman taking “Premarin”, a form of estrogen derived from the urine of a pregnant female horse. In those years and until today, women were also given, “Provera,” or Medroxyprogesterone, a semi-synthetic progesterone. Premarin + Provera have been effective for some issues women experience during the menopausal transition, however, they appear to have a dark side. This dark side was primarily revealed in a series of articles surrounding the Women’s Health Initiative (WHI) database and study in the early 2000s. Premarin (estrogen), when taken orally as a pill is subject to the so-called, first pass effect of the liver and gut. This means that instead of distributing evenly throughout the body a portion of the oral Premarin gets stuck in the liver and increases inflammation (eg C-reactive protein and blood clotting proteins) and increases the risk of vascular complications like blood clots, heart attacks, and strokes. Provera (medroxyprogesterone) had negative effects on the formation of energy in the mitochondria, brain, blood vessels and bones. Bottom line, in the WHI study in 2002 when Premarin and Provera were taken in combined fashion as “PremPro” researchers noted slight increased risks of breast cancer and vascular disease and a negative effect on brain health. 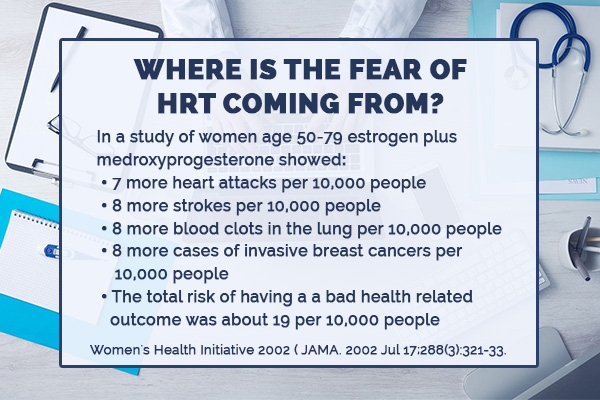 Where is the fear of HRT coming from? So, you can determine for yourself that the overall increase in risk here are not hugely significant, but definitely do exist. Importantly, it should be noted, that users Premarin (estrogen) by itself, however, lowers the risk of most of these – including a lower risk of breast cancer by 7 out of 10,000 people. But if My Body Doesn’t Produce it Anymore Should I Really be Taking It? If menopause is a normal phase of life…why would I want to take hormones afterward to bring me back to levels prior to menopause. Isn’t this unnatural? There are extremes in both camps of this debate. On one side you have the minimalists/conservatives that view any HRT pill, cream or prescription medication as unnecessary and potentially harmful. On the other side you have the “anti-aging” camp that strongly promotes pushing hormone levels in all women to levels of women in their 20-30s. So who is right? This comes down to a personal choice. There isn’t a great answer here, but some experts suggest that the evidence does not support NOT taking HRT. What!?! Double negative I know and kind of confusing, but some experts simply feels there isn’t enough good evidence to support withholding HRT from women given all the advantages. This brings us to Bioidentical HRT. Bioidentical HRT (BHRT) is the use of estrogen and progesterone in forms that appear more to the body as the forms it makes by itself. At the time of writing this article, I agree most with the idea of judicious use of BHRT in women with minimal risk for side effects (see discussion further on). When a woman’s estrogen levels plummet so do many of the other factors associated with accelerated aging such as, loss of bone mass (think osteoporosis), increased blood pressure (estrogen plays a role in the relaxation of blood vessels that keep blood pressure in normal ranges), inflammation and formation of forms of cholesterol that are more likely to be associated with heart attacks and strokes and even increased risk of breast cancer. That’s right…some evidence supports lower estrogen levels and higher likelihood of cancer. We all know that there are medications to treat high blood pressure, osteoporosis and cancers, but why not treat one of the underlying drivers of these processes in the form of BHRT? In partnership with a qualified, experienced healthcare practitioner, women can strive to find the lowest effective dose to optimize all the risk parameters and find out whether they get HRT’s positive effects on brain function.on. How Should I Be Taking HRT – What form is best? It seems that the most authoritative organizations support use with Transdermal forms of Estrogen – that is, taken as a patch or cream on the skin. A variety of forms of estrogen and progesterone can be gotten from retail pharmacies and drug makers or can be obtained in personalized doses and forms from a compounding pharmacy through a healthcare provider. When a woman’s estrogen levels drop during and after menopause a process is initiated in the brain that causes breakdown in the neurons (brain cell) and synapses (brain cell connections). The gradual accumulation of these changes over decades or sooner for some at-risk individuals lead to functional changes in areas of the brain that are associated with Alzheimer’s disease such as the hippocampus, hypothalamus, posterior cingulate gyrus and prefrontal cortex. These deleterious changes seem to be best mitigated if women begin on estrogen (plus or minus progesterone) during the time that this breakdown process begins, i.e. during and after menopause. This is the so-called, critical window hypothesis. The answer here isn’t entirely clear. But as mentioned above, in terms of prevention for brain related dysfunction and Alzheimer’s, the critical window hypothesis would suggest that the best time to start BHRT is around the time of menopause. Again, this is a personal decision. Some women choose to take this just within the few years around the time of menopause, typically while they are in their 50s. 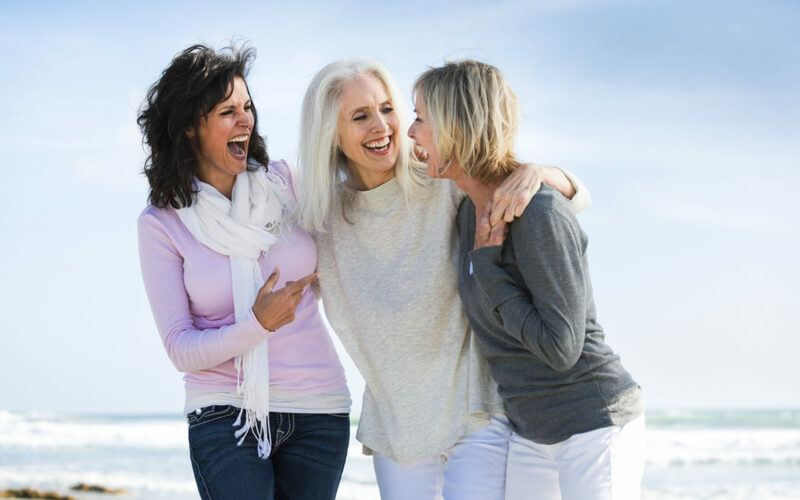 Other women choose to take personalized doses of estrogen and progesterone for longer periods of time in through their 60-70s and beyond. Long term data on brain health isn’t really available yet but we hope to see this. What are the Risks and How Do I know if HRT is Right for Me? As always, nothing in this article should be construed as medical advice. This is information for you to take to your healthcare provider so as to start a discussion about what may be the best fit for you. There are special circumstances such as if a woman has a personal or family history of hormone related cancers such as, breast or ovarian cancers. Your healthcare provider can order standard or specialized testing and interpret accordingly. According to some experts, the estrogen to progesterone ratio should ideally be about 10:1. Meaning to say, if your blood estradiol level is about 10 you may want to see a progesterone at about 1 or so. For post-menopausal women estrogen levels may be optimized at a level of around 40-60, but again there isn’t a consensus on this recommendation and should be decided in conversation with your healthcare provider. Dry urine or 24-hour urine hormone levels for estrogen metabolites to discriminate between 2-OH, 4-OH, 16-OH. the estrogens metabolized down the 4-OH and 16-OH pathways are more highly associated with hormone dependent cancers (eg breast cancer). Managing other forms of estrogen may decrease the risk of breast cancer and other negative health consequences. What Are Some Side Effects to Watch Out For? As always, talk to your healthcare provider, as some women respond poorly to BHRT or may need a dose adjustment because they experience breast tenderness, moodiness, or increased sleepiness. And some women simply don’t appear to experience benefits from BHRT at all for some reason. So, in summary, there is some evidence of small increased risk with HRT over time. On the other hand, there are proven benefits to HRT both in the short and long run. The jury is out on long term benefits of HRT and the brain but the critical window hypothesis suggests that the best time to start HRT would be during the perimenopausal period. We support judicious, appropriate use of BHRT in appropriate candidates that have not been able to obtain these results through proven lifestyle changes like diet, exercise, sleep, stress reduction, and low risk vitamin supplementation. would staying on the pill (I am on Loloestrin) cover me during critical window time period? as you know Loloestrin is not bioidentical HRT, but yes, it is an estrogen form that qualifies. of course, ask your doctor for details as we cannot give medical advice here.